We’re down to our last player in the Living Legends segment. We’ve looked at some phenomenal players so far, ranging from great goal scorers (Alex Ovechkin, Steven Stamkos), to great playmakers (Sidney Crosby, Pavel Datsyuk), to players of great size and strength (Jaromir Jagr, Jarome Iginla). The last player on our list combines all three of those attributes. That’s why he’s a 4-time All-Star, a Calder trophy-winner, has two Art Ross trophies (most points), a Hart trophy (regular season MVP) , a Conn Smythe trophy (playoff MVP), and was voted the most outstanding player of this past season (Ted Lindsay Award). Meet Pittsburgh Penguins‘ forward, Evgeni Malkin. Malkin is a an absolute monster of a player. He’s 6’3″ 195 lbs, and is as strong as an ox. When he’s dialed in, watch out. Today, I want to point out some of the more subtle things that Malkin does at a very high level, allowing him to dazzle us night in and night out. What do I mean by strength on his skates? Well for those of you that have skated before, you know it’s tough to maintain your balance when you are being hit, checked, slashed, and pushed. Now take that and add in making sharp turns and abrupt stops and dial up the speed to max. That’s hockey. Malkin makes skating look easy. He is so big and so strong that even as he’s being hit, slashed, and attacked, he’s still able to stay on his feet. If you do manage to get him to the ground, his upper body strength is so great that he can still make plays. There simply is no good way to defend him. Below are a couple of videos that illustrate his incredible strength and skating ability. This first one, I want to show you frame-by-frame sequence illustrating exactly how impressive his balance is. So here’s the first frame. 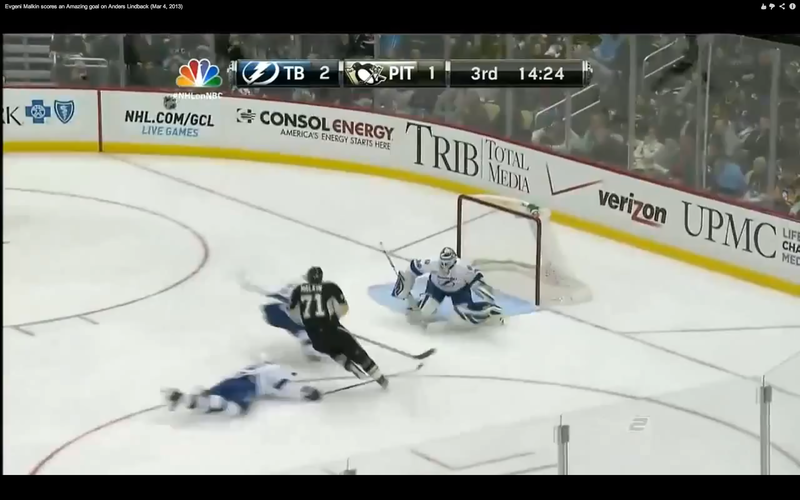 You’ll see Malkin cutting in on his backhand and the two Tampa Bay Lightning‘ defensemen trying to recover on him. Malkin is going to attempt to cut across the middle in order to get the puck onto his forehand. Malkin is beginning his cut to the middle here. Lightning’ defenseman Mattias Ohlund dives to prevent this cut and puts his stick flat on the ice to prevent Malkin from sliding the puck across and make it impossible to skate directly into the middle. For mere mortals this would doom the play. Malkin is no mere mortal. Malkin is simply ridiculous. In this frame you can see that he slid the puck under the stick of Ohlund and then he jumped over the stick to get into the middle of the ice. Please keep in mind that Malkin is doing this at top speed with two defensemen converging on him and space running out as he closes in on the goaltender. So let me recap that play. Malkin comes flying in down the wing, slides the puck under one defenseman’s stick, then jumps over that stick and behind the other defenseman. He then beats the goaltender far side. You want to talk about strength on your skates? This is the definition of it. This one is also ridiculous. Malkin is being slashed and shoved by New Jersey Devils‘ defenseman, Colin White. In case you were wondering, Colin White is no small man. White is 6’4″, 215 lbs. Imagine that hacking and whacking at you while you cut behind another defenseman and attempt to beat one of the greatest goaltenders of all-time. That’s unfair. Watch this goal. Well actually watch what happens before the goal. Watch how Malkin just shrugs off the check from the Ottawa Senators‘ defenseman. The guy attempts to stick-check Malkin which is a major no-no. The strength on his skates is simply to great to be slowed by a simple stick-check. When you are 6’3″, 195 lbs, you put yourself in position to win the battles in the front of the net. However, too many players in the NHL fall victim to what we like to call “the fly-by”. Players will make a beeline to the front of the net, but instead of stopping at the front of the net, they will cruise by and head behind the net. Malkin does not make those mistakes. When a shot goes to the front of the net, he drives straight to the front to pick up rebounds. Watch his playoff hat trick from 2009 against the Carolina Hurricanes. The first two goals are perfect examples of how he always stops in front of the net and wins those puck battles. The third goal is just a beauty and you can never watch that one too many times. 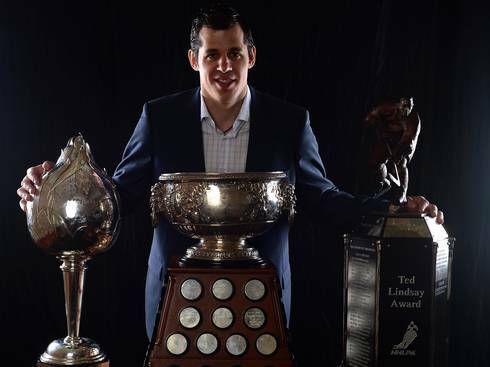 Did you really think I would write an article on Evgeni Malkin without mentioning his hands? My God, the man can stickhandle. We touched on this in the Living Legends article on Jaromir Jagr, but it is much harder to make moves as a big man. You have a longer stick, making it harder to pull moves on defenders in tight because that stick is much longer. Malkin makes it look like a piece of cake. Before watching the videos, I’d recommend grabbing a can of your favorite beverage, a couple of snacks, and then heading over to your favorite recliner. Sit back, relax, and enjoy the magic of Evgeni Malkin. This is unfair. People don’t realize how difficult this is to do. He’s about 5 feet away from Hurricanes’ goalie Cam Ward, and still manages to elevate it up and over him. I would go into the math, but then again I’m not great at math so we’ll leave it alone. Just trust me, that move is no cup of tea. The hands…oh my. This is not fair. I feel so bad for Colorado Avalanche’ forward Gabriel Landeskog. Wow. Malkin pulls his stick over Landeskog’s head so fast and then dekes Semyon Varlamov with one sick move. 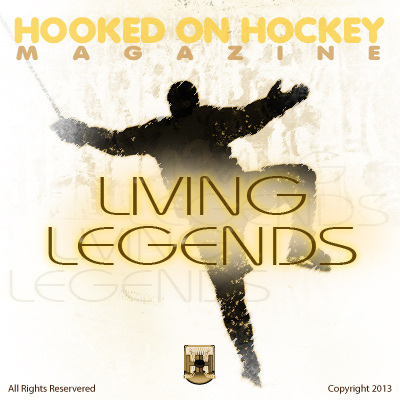 In 2 seconds, Malkin has put the puck through Landeskog’s legs and around Varlamov. Wow. You knew this goal was coming. Words can’t do this goal justice so I’m not even going to try and describe it. Just sit back and admire. This is the one part of his game where Malkin does not get the credit that he deserves. Did you know that in 2008-2009, Evgeni Malkin actually led the NHL in takeaways? That came during Pavel Datsyuk’s reign of terror, a three year span from 2006-2007 to 2008-2009 where he recorded 340 takeaways in those 3 seasons. Malkin ended his run by recording 94 takeaways in the 2008-2009 season to Datsyuk’s 89. Malkin has become very adept at making himself “invisible”, and then popping out of nowhere to pick off passes. Take a look at that first goal against the Lightning I posted. He darts out of nowhere to pick off that pass. Another example is the goal against Carolina that I have posted here. He picks Eric Staal’s pocket and then roofs it on Cam Ward. He’s become so good at picking pockets, and I would say that he’s just a hair behind your takeaway kings Datsyuk, Ryan O’Reilly, and Joe Thornton. He doesn’t get the credit nationally that he deserves, but I’ll try and make a start by giving him his due credit here. Alright. We looked at the strength on his skates, his nose for the front of the net, his defense, and most importantly, his hands. Those skills are a major part of what makes Evgeni Malkin. He’s an incredible physical specimen, a gifted playmaker, and a workhorse off the ice. That’s what I admire the most about Malkin. Despite his incredible talent and physical gifts, he works harder that 99% of players in the offseason. There are videos on YouTube of Malkin performing some incredible drills to stay sharp during the offseason. I think that’s why I admire him so much. That’s why he’s a Living Legend. That concludes our Living Legends segment. I hope all of you have enjoyed this little insight into what makes these superstars the players that they are.